NETWORK UPDATE: EXTANT, MASTERCHEF and LAST COMIC STANDING all found an extra 0.1 in final numbers. CABLE HIGHLIGHTS: A&E’s DUCK DYNASTY retained its hold on Wednesday cable, although it was down 0.14 from last week to 0.77. Lead-out WAHLBURGERS slipped 0.02 to 0.48, then DONNY LOVES JENNY was steady at 0.35, and LACHEY’S BAR scored 0.26. BET’s THE GAME jumped 0.16 to 0.69. CATFISH (MTV) gained 0.06 to 0.60, and was followed by the season premiere of AMERICA’S BEST DANCE CREW at 0.40. On History, AMERICAN PICKERS grew by 0.12 to 0.56, but THE WOODSMEN fell by 0.05 to 0.32. At USA, SUITS dropped 0.05 to 0.55, and MR. ROBOT was down 0.06 to 0.42. Lifetime’s LITTLE WOMEN LA returned at 0.51, with TERRA’S LITTLE FAMILY at 0.45/0.42. A pair of early evening Cartoon Network shows hit the Top 10, WE BARE BEARS at 0.47 and TEEN TITANS GO at 0.44. On ABCFamily, BABY DADDY had a 0.17 gain to 0.43, and MELISSA & JOEY was up a tenth to 0.37. IT’S ALL RELATIVE (TLC) dropped 0.03 to 0.22, and then I AM JAZZ was at 0.31/0.29, compared to a pair of 0.33s last week. On Comedy Central, KEY & PEELE rose 0.04 to 0.29, and WHY WITH HANNIBAL BURRESS shed 0.02 to 0.17. 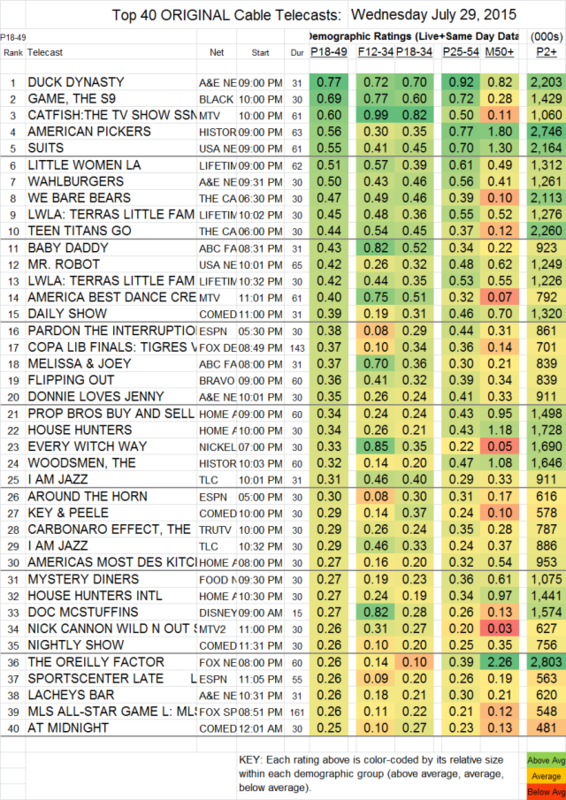 Bravo’s FLIPPING OUT was up 0.09 to 0.36, with MILLION DOLLAR LISTING at 0.25. The multiplatforming sitcoms THE JIM GAFFIGAN SHOW and IMPASTOR had GAFFIGAN at a steady 0.21 on Nick At Nite but down 0.05 to 0.15 on TV Land, and IMPASTOR down a tick to 0.17 on Nick and down 0.04 to 0.08 (with 438K total viewers) on TV Land; THE EXES, airing just on TV Land, gained 0.04 to 0.12. DEUTSCHLAND 83 (Sundance) was steady, for what it’s worth, at 0.01/72K. BIG BROTHER AFTER DARK (POP) was at 0.08/161K. The DAM report. IMPACT WRESTLING climbed 0.02 at 9PM to 0.11/343K, plus 0.02/64K at midnight (steady). RING OF HONOR appears only to have aired at 11PM last night, where it was at 0.04/171K.